The vicar has asked the children to come to the service today with the names of anyone who have died and who they and/or their parents want to be especially remembered at the service this morning. He has put some paper and pencils out for those children who wish to write any names down for him to read in the service. See below how they did on this rather sombre but not unhappy day as they remember those who have died. The vicar has asked Miss Enid to sit with some of the children as they think of those they have loved who have died and want to be remembered in this morning's All Souls' Day service. Tom tells the girls he is very lucky because he can't remember ANYONE dying in his family! However, he IS still very upset because his pet hamster, Bungle, died only a week ago and he still finds himself crying in the morning when he remembers he can no longer go and feed and play with him. 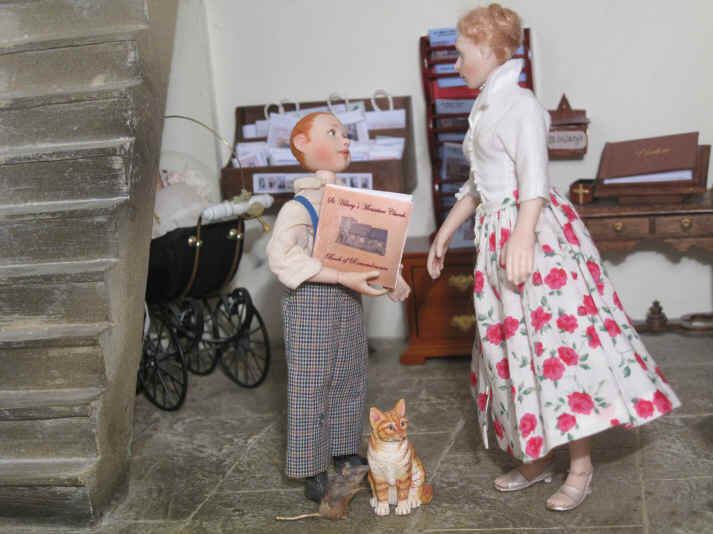 Miss Enid assures him that he can put Bungle's name down and the vicar will read his name out during the service. Emily and Megan both tell Miss Enid they miss their great grandmothers VERY much so want them to be remembered today. Miss Enid tells the children that she is writing down the names of her mother and father because, although it is a VERY long time since they both died, she STILL misses them very much. Ambrose brings the church's Book of Remembrance so that the vicar can read out all the names in there of the people who have died during the last year and had their funeral in St. Hilary's. Magnifi-Cat and Sepp are not far away............watching proceedings. Who have we here? It is Esme and Ernest the local pair of Mallard ducks who live on the pond in Daffodil Green. Ernest is looking very embarrassed................ Can you see that he doesn't have ANY piece of paper at all. That is because he can't read or write unlike Tinker who is a VERY clever cat who is waiting in the congregation to bring HER piece of paper up to the vicar. 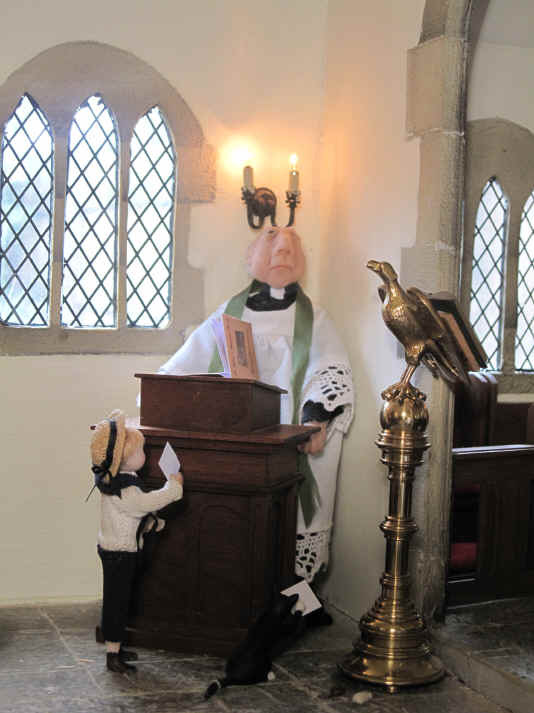 However........the vicar is still very pleased that Ernest has come up because he tells him that it is very brave of him to confess this in front of everyone else. He assures Ernest that there are many people too who can't read or write but it doesn't matter to God at all...........because He loves us all! Ernest tells the vicar that he wants him to remember his Mum, Elsie, especially because she only died a month ago and his father, Eric, is very lonely and sad now. 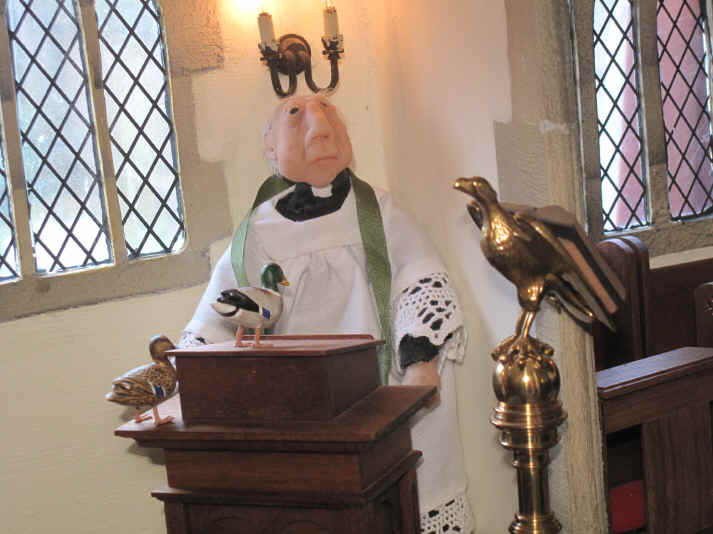 The vicar tells him that he will be honoured to read Elsie's name out during the service! The time is here and the vicar is opening the Book of Remembrance to read the names out. However, before he starts to read the names from the book he asks the children who have written names down to bring their pieces of paper up to him so that he can read those names out too. Look who is here first with her piece of paper.............! It is Tinker. Isn't she a clever cat because she has been able to write down the name of her grandfather who she still misses VERY much! 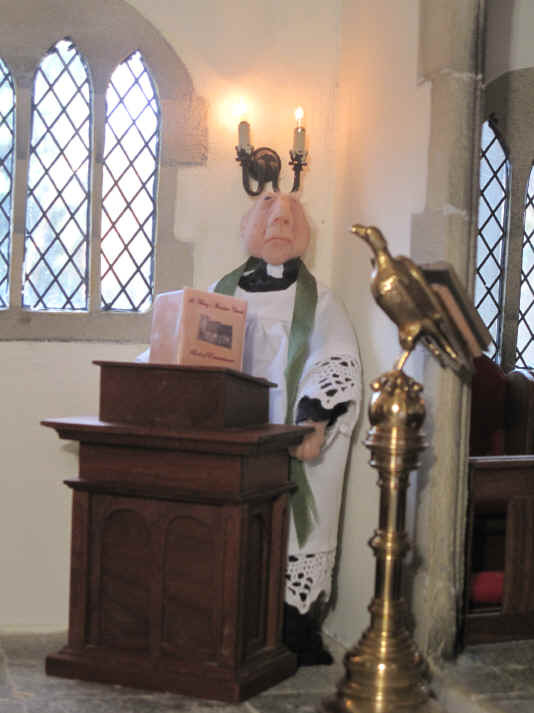 However...............the vicar cannot see her can he? 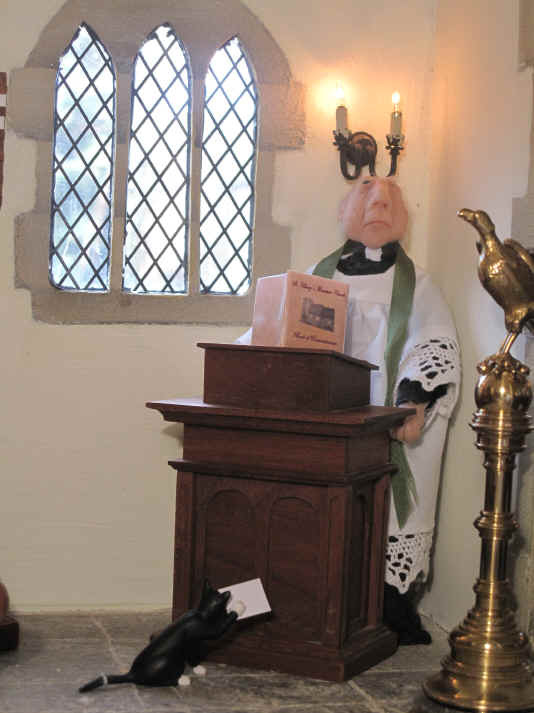 Oh dear........................Tinker is STILL waiting for the vicar to notice her. Tom is kind and tells the vicar that Tinker has a paper to give him and the vicar agrees to read her name out too! After all the other children, including Emily and Megan, have brought their pieces of paper to him with the names of those they want remembered and read out, the vicar reads ALL the names he has. Of course he HAS to remember dear Ernie who was their much loved churchyard gardener and who died during the last year. The Book of Remembrance is available for those who wish to remember their loved ones and for those who have already signed it you can see them on both our Book of Remembrance Archive and current Book of Remembrance. Bungle is the name of a pet hamster that my sister, Catherine, had a few years ago now. I have many fond memories of little Bungle as we watched him running around the living room in his "Bungle Ball "as we called it! He was a very sweet natured little hamster and I am sure that Catherine still remembers him with much great affection as do I!